The premise of 11.22.63 is great, and interesting, and while the material is too long for a feature film, it is too short for an 8 hour mini-series. Stephen King has been one of our most prolific writers of the last 30 years. He also has a knack for thinking outside the box, making us think in new and interesting ways and scaring the pants off us all at the same time. His novel 11.22.63 definitely does the first two and a small portion of the third. Since so much of his writing is incredibly vivid and haunting, it usually begs for a big screen adaptation as evidenced by movies such as Carrie, Misery and Pet Sematary. 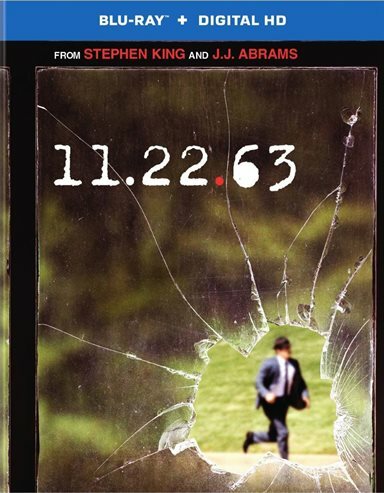 His work behind 11.22.63 was also originally considered for a movie, but there was so much detail that it was decided 2 hours wouldn't be enough, and thus was born the eight hour mini-series on Hulu. For those who don't have a subscription and were unable to see it, 11.22.63 can now be purchased on Blu-ray and Digital HD. High school teacher and divorcee Jake Epping (James Franco; The Adderalll Diaries) is bored and frustrated until one day his elderly mentor Al Templeton (Chris Cooper; August: Osage County) asks him to time travel in order to stop Lee Harvey Oswald (Daniel Webber; Deceit) from assassinating President John F. Kennedy. As he travels back in time, Epping alters the future by changing the past. The past, however, is pushing back and trying to stop him. Epping must find a way to navigate through to that fateful day in November, while also working through his love for 1960's librarian Sadie Dunhill ( Sarah Gadon; A Royal Knight Out). Epping makes several "jumps" throughout the season beginning in 1958 and eventually completing his task and stopping Oswald in 1963. He finds Oswald's family and friends along the way and enlists them (knowingly or otherwise) to help him in his quest to stop Oswald. With drama, suspense, romance and action, one would think it would be a sure-fire hit. Unfortunately, one would be somewhat mistaken. The premise is great, and interesting, and while the material is too long for a feature film, it is too short for an 8 hour mini-series. Somewhere in the middle, the details get muddled and off track. While the plot eventually swings back around, there are details and information we simply don't need. This tends to bog down the story and interrupts the pacing. The cast is one of the saving graces of the show. Franco, whom I usually find annoying, is less so in this role, though, he often seems confused. I can understand the confusion in the first few episodes, but it grows old quickly. However, I feel he is adequate as Epping, which is a nice change. Cooper is wonderful and it's really a shame we don't get to see more of him. Gadon is simply lovely, as if she was actually transported from the 1960's to play this role. Webber also shines as Oswald, a very disturbed and troubled individual with a calculating mind. Overall, it's a terrific cast with strong dialogue to help them along. The Blu-ray is presented in 1080p high definition video as is standard nowadays, but since some of it is shot outside, it makes the color scheme beautifully vibrant. Variations of hues found in nature come to life with a sharp picture. The DTS HD 5.1 master audio is clear with a full spectrum of sounds and a decent mix that doesn't make certain sound effects overpower the dialogue. The lone extra on the Blu-ray leaves something to be desired. Entitled When the Future Fights Back, the feature is 15 minutes of discussion with the cast, Stephen King and executive producers J.J. Abrams (Person of Interest) and Bridget Carpenter (Friday Night Lights). While the information and insight is interesting to a certain extent, I wish there had been more about the actors views on their characters, as well as more discussion as to how the novel was adapted for the small screen. Fans of the mini-series will be happy to hear there may be a second season coming to Hulu so if you are already a subscriber and you like the show it's possibly good news. My verdict - if you subscribe to Hulu the show is worth watching. If not, go buy the Blu-ray so you can be ready in case season 2 next year. Download 11.22.63 from the iTunes Store in Digial HD. For more information about 11.22.63 visit the FlickDirect Movie Database.